his example of fine art jewelry features a Black Coral Bracelet with a 22 karat Gold clasp. When you look closely you’ll see that the clasp extends the organic contours of the coral. It took a total of 197 hours to complete this deceptively simple looking piece of fine art jewelry. It’s elegant simplicity adds a great deal of versatility, because of this Black Coral Bracelet could be worn with a Coco Channel or as a stylish accompaniment to casual attire. The body of this fine art bracelet is formed by shapely piece of Indonesian Black Coral. The art of bending Black Coral into a bracelet shape is a gradual process and a jealously guarded secret. Wearing a Black Coral Bracelet means that you’re carrying on a very ancient tradition. Did you know that coral was one of the first materials to be worn as jewelry? Black coral has been used in jewelry and amulets for tens of thousand of years. Early peoples believed that wearing black coral would protect them by warding off both evil and injury. The healing qualities of Black Coral are well known to the Polynesian. Traditional doctors ground black coral branches into a medicinal powder that is used to cure a wide range of illnesses. The Latin name for Black Coral is ‘antipathes subpinnata’. In Latin the name, antipathes, actually means “against suffering”. Even though we’ve made a few variations of this design, no two pieces of black coral are the same, so it’s naturally a one of a kind piece. 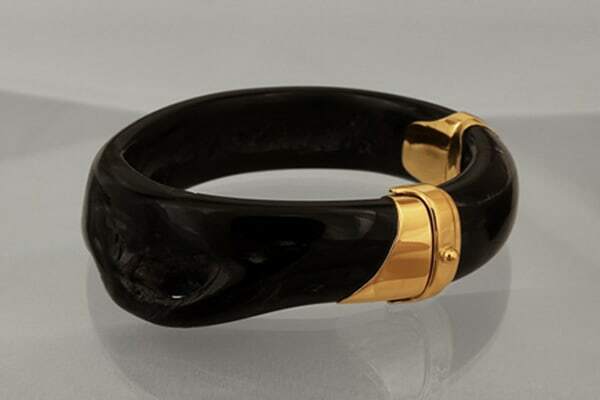 This Black Coral Bracelet is no longer in the collection and was sold for $6397.00. However, if you’d like a similar Black Coral Bracelet designed for you contact us.